If you’ve ever locked keys in the car, you know how frustrating it can be. Assuming that you’ve decided not to risk hiding an extra set of keys on your car, here are a few tips on how to open a locked car door. Prying a car door open with a crowbar will make people think you’re stealing your car. If you tend to be absent-minded and lock keys in the car fairly often, you might be tempted to hide an extra key somewhere on the vehicle. Unless you’re very clever about where you hide it, you may be inviting someone to steal your car or its contents. Those little magnetic boxes that stick to the metal surface of the body or frame are the best bets here, but be sure to place your box in an obscure and hard-to-reach area where it can’t jiggle loose and fall out. Be imaginative! Struggling a little to reach that extra key is better than giving the car away easily. And don’t hide your extra house key with it. You don’t want to give everything away, do you? Even better, get a spare key made and keep it in your purse or wallet. Rather than hiding it on the vehicle itself, you’ll have it with you, unless you happen to leave your wallet or purse in the car, too. Figuring out the best method for how to open a locked car door depends on the tools you have at your disposal as well as the type of vehicle you have — more particularly, the type of locks installed in your car. If you have the old-style door locks with little buttons on the window ledge, you should be able to unlock your door with a wire coat hanger. To do so, straighten the hanger and bend the end into a little hook. Insert it between the rubber molding and the side window and then carefully hook it around the door button and pull it up. You’re in! If you have smooth buttons, you can try to hook one using the hanger technique, but most will refuse to budge. Another method is to use a door stop (or wedge) and a long metal rod. Then, you take the same approach, inserting the wedge into the top of the door to make an opening. Place the rod into the opening and use it to push down on the unlock button of your car. 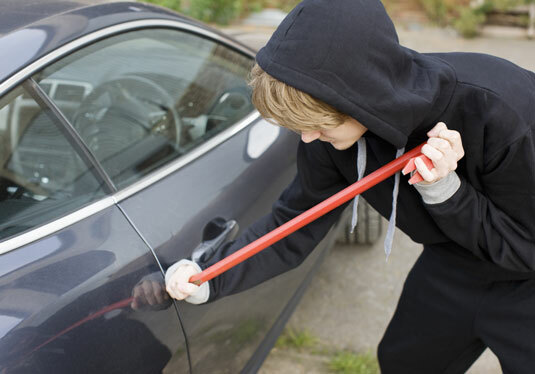 In either of these cases, you’ll need the right equipment on hand if you lock keys in the car. Unfortunately, if your vehicle has door locks that are recessed inside the interior door handle, get professional help. If you happen to lock yourself out of the vehicle while you have the trunk open, you may be able to move the rear seat out of the way and gain access to the rear of the car (or you can hide an extra ignition key in the trunk or your emergency car kit or toolbox). Fortunately, many new vehicles come with electronic door openers or “digital keys” that don’t allow you to lock the doors with the keys in the vehicle. The downside is that if you lose the gadget, it can take days and hundreds of dollars to replace it, and you’ll probably need to have the vehicle towed to a dealer who will order a new key. If your vehicle has an electronic door opener, you may be able to get the door open, but if you’ve lost the opener outside your vehicle, the ignition may fail to start without it. Some vehicles have override switches for this, so find out whether you’d be able to start your vehicle without your opener, and locate the override switch now, if there is one. If you lock keys in the car and need professional help, call emergency road assistance and ask if they will be able to open the door. If not, ask them to send a local locksmith. The good news is that each car key is coded by the auto manufacturer, and if you have the key code number and personal identification, a locksmith can make you a new key. Write down the key code number and leave it where someone at home can read it to you in an emergency. You might need the VIN (vehicle identification number). This is usually located on a panel on the dash above the steering wheel. It should be visible from outside the vehicle. Unfortunately, it is sometimes inside the door panel, which will do you no good if you lock keys in the car. If you can get to your insurance paperwork, or your insurance agent (have one on speed dial? ), your VIN is on each page of your policy. Car keys are supposed to be one of a kind, but it helps if you know the year your car was manufactured, the make, and the model. For example, a 1975 Chevrolet Nova or a 2015 Chrysler Sebring. Besides the obvious helpers—AAA and other roadside emergency programs—you might be able to turn to your local dealer. If you’re driving a Chrysler, for example, and there’s a Chrysler dealer nearby, you can probably get them to provide an emergency key that unlocks the doors and trunk. These keys will not enable you to drive. Be prepared to show proof of ownership, however. If you’ve borrowed your uncle’s vehicle for the day, dealers won’t be too willing to help you.